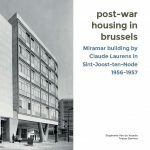 In November 2016, 2 new publications on post-war housing in Brussels are published, by the Vrije Universiteit Brussel. 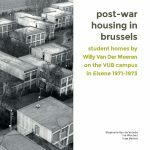 The first book deals with the student homes on the campus of the Vrije Universiteit Brussel in Elsene, designed by architect Willy Van Der Meeren in 1971-1973 (by Stephanie Van de Voorde, Ine Wouters and Inge Bertels, ISBN 978-94-91912-061). The second book focuses on the apartment building Miramar in Sint-Joost-ten-Node, designed by architect Claude Laurens (Stephanie Van de Voorde, Tristan Boniver et al., ISBN 978-94-91912-078). Both publications are available for download on the RetroCo publications page. By means of the analysis of these two case studies and their building history, the publications shed light on the building materials that were applied in the post-war period. As such, they can contribute to a better understanding of the qualities of our post-war heritage, in view of safeguarding their future and support respectful renovation strategies. Indeed, the post-war heritage finds itself under great pressure today: the heritage value thereof is not always recognized and its future is often uncertain. These 2 new publications are a follow-up to a trilingual publication on building materials that were applied in post-war housing in Brussels (1945-1975), published in December 2015 (Stephanie Van de Voorde, Inge Bertels, Ine Wouters, ISBN 978-94-91912-047). This book can, together with additional documentation, be consulted and downloaded on www.postwarbuildingmaterials.be. ← > AIM-ES Guidelines document available now !